I've never heard of The Sky Crawlers before a review copy of the new Wii game, The Sky Crawlers: Innocent Aces, showed up at my door. Still, it intrigued me, as a flight game on the Wii from the team that brought us the Ace Combat series. If you aren't familiar with The Sky Crawlers, they were a series of Japanese novels that came out in 2001, and later adapted to an Anime movie, pieces of which make up the cut-scenes of the game. You start the game as rookie pilot "Lynx" and enter into an alternate world where dogfighting the skies is corporate driven in a peaceful world. To be honest, I'm not a huge fan of the waggle. Most Wii games seem to misappropriate the use of motion controls instead of using them in something natural. Flight controls have the possibility to lend itself quite well to utilize motion, and Sky Crawlers almost gets it right. The first oddity is the default control configuration reverses the nunchuk and Wii-mote position, placing the Wii-mote in some people's less dominate left hand. I swapped hands interchangeably, and the game didn't seem to care one way or the other, though it felt a bit more natural in the default setup. The nunchuk is used to steer the plane, imagine it a bit like a joystick, and the Wii-mote deals with acceleration, tilting it up speeds up and down slows down. As I said though, these controls seem almost backwards in not only the hands they suggest but which device should accommodate which function. After a few missions though, you won't even notice. Because the controls work during gameplay. Your plane controls and floats with ease as you steer it, and you never actually feel like you are fighting the controller. There's even quick access to turns and barrel rolls with the analog stick and A button, which saves your wrists a bit. A common problem with dog fighting in flight games is getting position on your enemy. A constant stalemate of seemingly endless turns to only catch your opponent on the screen for a brief second frustrates a lot of folks. The Sky Crawlers uses a system called Tactical Movement Command in which locking yourself in range of a enemy for a set period of time lets you execute a quick move that cuts to some fancy flight maneuvers and places you directly behind the opponent. It may sound "easy" but in the chaos of some of the later battles it really only helps with orientation, still, it's a feature I'd like to see implemented more in arcade style flight games like this. As with what seems to be a standard on the Wii, the game offers "assist type" co-op play through the entire game. At any point another player can pick up a Wii mote and control an on screen cursor for shooting down enemies. It's not ideal, but its actually quite a bit of fun, and I found myself positioning certain ways so my partner could pick off the planes just off to the right or left of my targeting system. The biggest difference between the co-op in single player is the speed at which you can blast through the levels, with twice as many guns firing it's pretty obvious to see why. The single player isn't really difficult, and the co-op almost makes the game too easy. 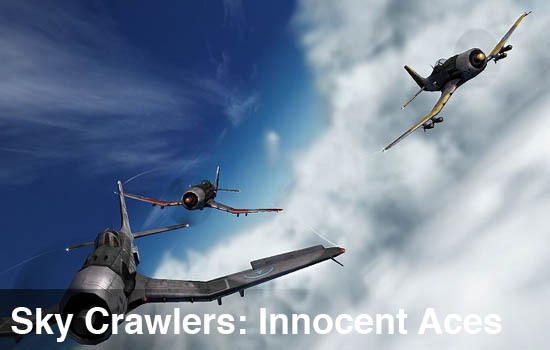 The Sky Crawlers: Innocent Aces was a pleasant surprise for me. It won't win any awards for graphics or sound, but it's an admirable game on the Wii. The controls draw you in, and the story is pretty interesting to with some nice twists along the way. Would it have been nice to see a true co-op mode with each player controlling their own plane? Most definitely. To be honest the game is more fun than it has a right to be through the 18 missions in both single player and co-op. 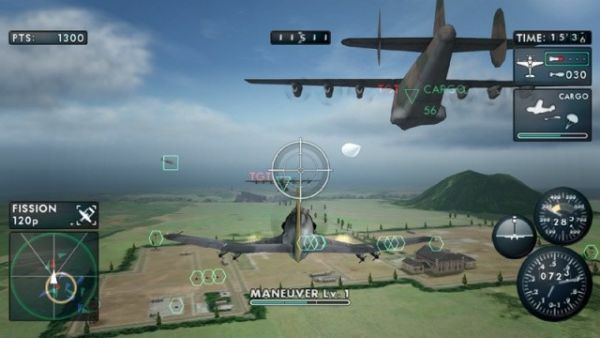 The Co-Op Experience: Player 2 gets their own targeting reticule and can help shoot down planes and targets as Player 1 controls the airplane and main guns. Page created in 0.8010 seconds.